I first met Marla Waal when we were in our early twenties. We danced together briefly in The Nutcracker while I was dancing with Les Grands Ballets Canadiens de Montreal and she was in the school’s professional training program. We lost touch, had full dance careers and twenty-five years later fortuitously find ourselves working at the same Pilates studio. It is here at the studio, among the mats and Pilates equipment that we sit down and reflect on our careers and experiences with the often difficult and emotional transition out of dance. Edmond Kilpatrick– Thanks for doing this with me. I came to the idea for this interview after our discussion about mortgages. It was a reminder of how we had moved on from our dance careers and I realize you are actually a step ahead of me in the transition away from dance. EK – Yes, I have one foot in my dance career and one foot out and I’m having a hard time getting that second foot out. MW – Interesting. Then, in that sense, I have both feet out and have had for some time. EK – I’d like to talk about what that was like. But first, let’s go back to the beginning. Where did you start dancing? MW – I did my early training in Victoria, BC then went to the school connected with Les Grands Ballets Canadiens de Montreal [École Supérieure de Ballet du Quebec]. Then, I went on to dance with Les Ballet Jazz de Montreal [now known as BJM Danse] and after, Hubbard Street Dance Chicago. EK – Did we dance together in your last year of school? MW – Yes, I squeaked into the cast of the Nutcracker in the second of my three years there when mostly third year students were invited to dance with Les Grands Ballets Canadiens. EK – How long were you at Les Ballet Jazz? MW – Just over four years and then four years in Chicago. EK – That is a good amount of time in each company to be able to achieve something. MW – Yes and I would say there was something very similar about both arcs, which is probably what made me feel ready to leave. Both times I was hired through a long audition process. I was very excited to join these companies and the directors were excited to have me, but both times I felt a huge drop, like the rug was pulled out from underneath me. Both times I felt I was coming in with a very high status and both times I arrived and felt I had to fight my way back to that status. Initially, there was not much for me to dance or interest to put me in the new choreography. It would turn out that I was hired to fill the shoes and costumes of a few other tall girls that had just left. So, when new work was being created I never felt I was at the centre of it and there was a lot of frustration. Then about two years in I would start to make some headway and by the third and fourth year I would be in a really good place dancing in some nice roles, still not being part of the new creations, but getting good roles to dance and finding a lot of satisfaction. But by the time I had proven myself and had some time to enjoy it I thought my work there would be more of the same and there wouldn’t be much room for growth beyond that. 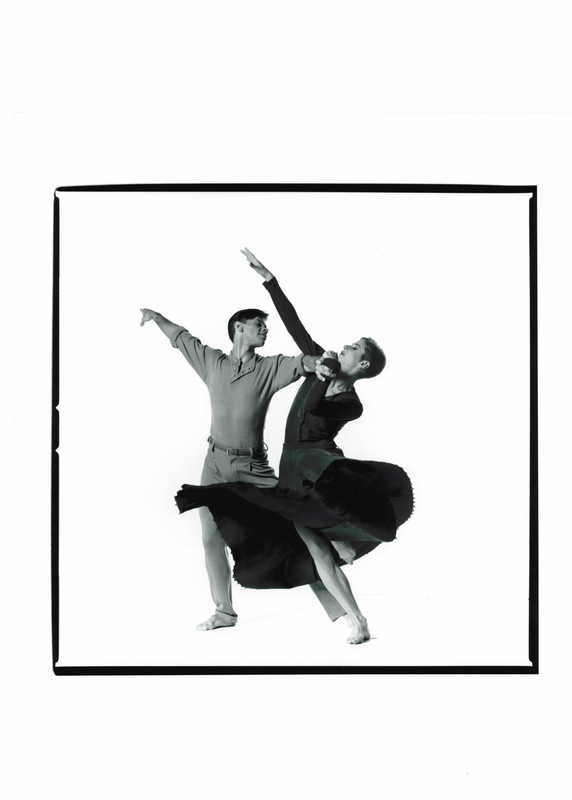 EK – Was Hubbard Street a larger company than Ballet Jazz and how many dancers were there? EK – I realized in my last year at Les Grands Ballets Canadiens that I wanted to be in a smaller company. EK – I wanted to be in a company where everyone was integral. MW – Yes, and Les Ballets Jazz was an exercise in frustration in that because we were twelve dancers and it seemed so ideal. But as often happens, there were three or four dancers dancing in everything. There should have been the opportunity for interchangeable parts. We were performing like circus performers in tons of shows in crazy venues everywhere, so those three or four people would burn out. They would get injured and we would have to change the program. It seemed to make no sense to me that we didn’t have two full casts of ballets where the cast of dancers could rotate and interchange. It was very frustrating. A few times I ended up learning someone’s part that afternoon. If we had just spent time in the studio with the idea that I would do a few shows [it could have been so much more satisfying]. So, you wishing that you were in a smaller company… I was in a smaller company and it was such a missed opportunity. It seems, this ideal situation so often doesn’t happen. Marla Waal and Ron de Jesus in Jardi Tancat by Nacho Duato. Hubbard Street Dance Chicago, 1997. EK – Did you come back to Canada after your time at Hubbard Street and what motivated that move? MW – Yes, I was in Chicago and reconnected with someone from high school and we fell in love very quickly. I was ready for a move at that point. I was going to go to Portugal and dance for a company there when Peter showed up. I thought this was a good time to make a choice for my life rather than make a choice for my career. It’s a bit idealistic, but I felt ready to choose my life and then make my work happen where my life was going to go. Rather than continue chasing … now I’m going to go to Portugal, now I’m going to go to Amsterdam … as much as I liked that. I was twenty-seven at the time and I started to feel ready to bring in some other pieces of my life. I thought I’d still dance and do some freelance work. But in Canada it’s really challenging, you have to work and fight your way in no matter what you’re trying to do. I realized I was quite exhausted after my years of company work. I did a little bit of freelance dance work but I found that I didn’t have the extra gas in the tank to push and promote myself one more time. I just felt really exhausted. EK – That’s interesting. That’s how I felt when I left Ballet BC. I didn’t realize how tired I was. After I left, I worked with Wen Wei Dance for a couple of years, which was really great, and then once I got married I let it all go. Well, I did and I didn’t let it go. I kept trying to make projects happen but I was also closed to many opportunities because I was so tired. MW – Yes. I did one project in Vancouver. It was a solo project. The choreographer had hired me because she had injured her knees. It was a very intense forty-five minute solo with three musicians and I was the only dancer in the room. Each musician would finish his part and exit the stage so I had a huge responsibility to hold the energy up and hold the performance together. But I was kind of up for it. When I discovered the musicians were getting paid twice what I was because they were union it took the wind out of my sails. Because if one of them didn’t show up we still had a show, if I didn’t show up we had no show. I was devastated. I guess, for that point of my career it was a real blow. When that project ended, I collapsed on the couch for about two weeks. That was when I really realized how tired I was. I laid on the couch and it was like a wave crashed over me of all the years of not really listening to my body … and doing and doing and doing … and chasing the carrot … and I kept going and going and going … and I was constantly ignoring how I actually felt in my body. EK – How old were you at that moment? MW – I was about twenty-nine. I still felt in good shape and I didn’t feel I was too old to be doing what I was doing. I just felt the fatigue from all the years. I wasn’t injured, I was actually doing fine. Around that time I went to my first yoga class. It was a gentle, simple Hatha yoga class. There were no mirrors. I fell in love with yoga and it was therapy for my body. I did very simple, non-achievement oriented yoga, just literally hug your knees to your chest and rock side to side, take few breaths into your belly, very old school Hatha, and after that I never did another dance class. MW – Once I found a place and I experienced this feeling of being able to listen to my body something relaxed. I was doing some acting at the time and those classes were also unraveling some of the damage that had happened in my career. Once that unraveling process started I couldn’t go in reverse. I had to keep going with listening to who I am and what I actually needed as a person. There was a period during that healing time where a lot of abuses were coming up in my mind. You know, abuses from various dance partners, and what I mean by abuses, being pushed or shoved or yelled at, nothing that would register very high on a scale of abuse. EK – I had a similar experience, but it happened for me in Peter Bingham’s contact improv class. It starts out lying on the floor relaxing, releasing muscles. My first thought was, have I ever released these muscles before? Then, once I released them these emotions and memories came up. Memories of, like you said, difficult, challenging times in the studio. That’s when I realized how exhausted I was. MW – Yeah. I felt that too. EK – What happened next? MW – I had a five-year period after I left company dance work where I went quite deeply into all the things I ever wanted to do. Kind of like a smorgasbord of stuff. I got involved in photography and contemplated becoming a dance photographer but then, this is going to sound strange, I realized I was going to have to be around dance and dancers all the time. EK – Were you afraid you could never get away? MW – No, it was more like freelance dancing. I would still have to schmooze my way into the dance community to get work. And the way I felt at that point, I was tired. If I was welcomed in and people said, “Marla, you have this to offer. Come here and do this with us.”… I needed that extra juice from someone to invite me in. Then I could have shown up and found it but that’s not how it works. Not to blame anyone but I didn’t receive that, maybe some do, but I didn’t. I took a small business course at BCIT and did fashion and costume design. I was interested in business and I liked to make things so I spent some time and money trying to make something happen but it really didn’t go anywhere. I was basically doing a million things and not getting paid for any of them. It was fulfilling but I was giving my energy away. I was learning and gaining experience while in a new way exhausting myself. I did four years of improv theatre on Granville Island. That was really healing, because different from regular acting, even when you practice it you’re doing it. You’re the writer, director and actor all in one moment of theatre. I enjoyed the Zen of improv and it matched up well with the yoga and meditation I was doing. I found a great home there for several years, which was a great replacement for my dance gypsy family. I found a comedy gypsy family and I’ve been a comedy junky my whole life. EK – A lot of dancers when they are stepping away from their dance careers have a hard time getting out, there is something that pulls at them to return to dance. EK – Did you feel that? MW – Physically, I didn’t feel the pull back to dance and that could have been because I was doing a lot of yoga. But I had replaced, I think, the dance aspect with acting and improv theatre. EK – Tell me about the acting. MW – At one point, I felt I was dabbling in acting and wasn’t taking it all that seriously. I thought that if I really wanted to be an actor I should do a theatre program. I wasn’t going to find success because I look like a model so it would have to be based on my craft. The same way dance was a craft this was a craft so I should respect it. I looked at all kinds of programs and had it in mind that I would give it two years. More than two years seemed too much. For several weeks I researched all these programs and there was one day I will never forget. I was about to register for a theatre school and from deep inside my body I heard this resounding, NOOOOOOOOOOOO! And I thought, “I can’t do this.” I feel that at that moment the performer in me got yanked out at the root. It was such a relief and kind of painful. I remember back at Hubbard Street we would perform all over the United States and dancers would come back stage and someone would say, “Oh, she danced at this time and did this role,” and as a young dancer at the time I would think to myself – I would never say this out loud – “I bet she wishes she was me right now. She’s old and washed up. I’m sure she wishes she was still in the company and wishes she was in my spot.” I just couldn’t imagine at the time how that person coming backstage with her kids and her dance career over could be happy. So, when this performer thing got pulled out at the root I had actor and dancer friends that were getting roles and grants for their work, or what have you, and I was actually happy for them. There was no envy. There was no wishing it were me. That’s how I knew I got it at the root. I wasn’t pretending because I had this new sense of joy. And there was no bitterness there. So, that was a really good moment. EK – I spend no time around Ballet BC. Partly because I needed a clean break but also because I don’t want to seem like I’m hanging on. MW – I also had the experience of going back to Chicago a few times to visit the studio and see the dancers of Hubbard Street. I saw they were still dancing the same choreography and the people who were in the position I was, who had to fight their way in, were finally dancing some lead roles. And I thought, “Wow,” of course I’m saying, “That’s great, good for you.” But a part of me is thinking, “Oh my God, if I just hung on for five years I could have danced these roles.” It just didn’t seem like enough. It would have seemed like arrested development. They were so focused on getting to dance that role that they really didn’t grow in other ways. Now that’s a judgment on my part. I don’t really know, but that’s how it felt. EK – Maybe that’s a judgment on how you would have felt if you put yourself in that position. MW – Exactly. And that was my experience being in that dance company environment. It’s so all consuming. You’re traveling a lot with the same people. It’s like a gypsy family and in some ways it’s a wonderful experience, but in another way, you eventually have to grow up and leave your family. To hang on is like, if you kept living at home in your parents’ basement. Yes we traveled the world, but I traveled the world where someone basically collected my passport and handed me a plane ticket and said the bus is over there, get on it. Basically telling us to get in line like preschoolers holding a rope. And here is your hotel and here’s your money for your food. You’re treated like a child. And then someone says you will dance this role and then, no, you’re not… yes, you are… no, you’re not… so you are a tool. EK – At what point did you start your family? MW – It was around the time I felt the relief from the need to perform. I realized all the businesses and the things I tried to do were my attempts to figure out what was going to be my next big thing. So, at a certain point, soon after I pulled out the performer at the root and I had tried some business things I felt my ambition drop. I started to feel content with teaching yoga and started to see it was something I do naturally. I’m naturally good at it and I could see my dance career starting to inform my yoga teaching. It started to make some sense. I was starting to feel in my element and I thought, “You know what? This is actually your thing. You’re quite good at it. You enjoy it. So just relax.” and that’s when I started to think I’m ready to be a mom. At that time my husband’s career was starting to take off. So I thought, “I’ll hang back and I’ll be the mom.” In my younger years I would have never thought I could be happy doing that by choice or that I’d ever find pleasure in laying low. I was always afraid my husband wouldn’t let me. I always felt like a racehorse … “Got to let me go. I’ve got to do this.” … I was always ambitious, not cutthroat, but focused and driven. So when that dropped at the same time the performer was released I felt ready to have kids. It was good. EK – Ok, let’s play a game. If you were to go back to the time when you were dancing at Ballet Jazz and Hubbard Street how would you have defined yourself? MW – I would have called myself a dancer and performer. EK – Fast forward to after you left Hubbard Street Dance looking for dance work in Canada. MW – I would have still defined myself as a dancer. I felt I had worked so hard up to that point that I wanted life to show me what was next. I was willing to leave dance but I still considered myself a dancer because that is what I could do and I’d been doing it for so long. 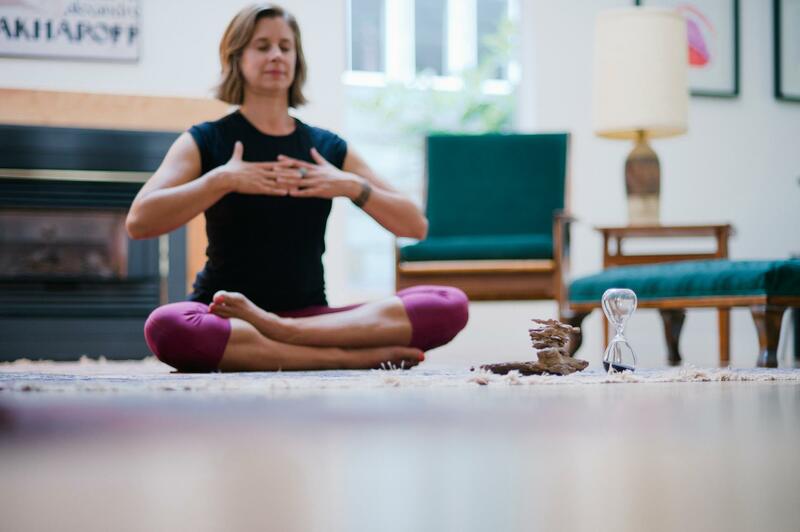 EK – How would you have defined yourself after you began teaching yoga? MW – I would have said that I’m in transition. I’ve been a dancer and now I’m doing lots of things. I was playing a game with life, opening all these doors and I wanted life to show me the right one. I spent a lot of time frustrated with that. Not knowing where to put all my energy, I put a lot of energy into a lot of things. I spent probably five years being quite indecisive but I would have described myself as being in transition. I was a dancer and now I’m waiting to find my next thing. EK – What about now? MW – I have a 3 year old and a 6 year old and in the last few years it’s clear to me that my first title is mom. I’d define myself now as a mom and a yoga teacher. EK – That is clearly a transition. MW – I guess so. A lot of it was pretty bumpy and painful. When I realized I was finished dance I had that feeling like graduating high school, like you’ve been released into the world and you have to look around for what to do next. And your dance career, sadly, doesn’t leave you with much. I felt at times sad that I was going to need to move away from this tool box that I had created out of nothing, you know, as a dancer you become a master to some degree at your craft and it was a bit sad to just leave that. It’s also sad that there is not much value to it. I can’t take that craft out into the world. Now I feel like I’ve painted myself in this corner where some of my experiences haven’t put much money in the bank. So it takes some creativity. Hopefully, I can use my creative mind to figure out ways to use my talents to make money. But it’s not a huge problem, I guess. EK – I think a lot of people outside of dance are dealing with similar issues with money. Maybe, that’s one more indication you’ve left dance and joined the rest of the world. EK – Thank you so much for this.